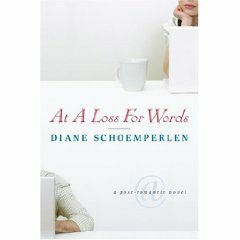 I happily discovered Diane Schoemperlen’s At a Loss for Words after entering “Writers’ Block” in the subject line of a library search. It is indeed about a blocked writer, but expression through words is not what’s blocked. Billed (unfortunately) as a post-romantic comedy: narrator meets a former lover after thirty years and they begin a relationship, much of which takes place via email because they live in separate cities. It’s that simple. And that not simple. Schoemperlen’s use of lists, daily horoscopes, pointers from self-help guides, actually become part of the narrative, moving the story along at the same time they move (or not) the narrator’s life along, but it’s not really the narrator’s story; it’s the reader’s story. Once we begin to realize the truth of what’s being experienced and the uninhibited hopefulness by which that truth is being conveyed we, the reader, can no longer just observe—we begin to recognize something about it as our own. And the recognition makes us squirm. I doubt that it would matter whether the reader is a man or woman, how young or old, straight or not, or what background or part of the world they came from because what Schoemperlen has done is more than tell a story about relationships—she’s deconstructed the obsession of neediness. The book has less to do with relationships with others, than the way we see ourselves—romance is merely the vehicle Schoemperlen has chosen to convey a much broader truth. —Purchase At a Loss for Words online at Blue Heron Books.